“BLK_LAB uses a series of thoughtfully placed windows to achieve a combination of passive solar design and an advanced thermal envelope,” says architect Christopher Patano, founder of Seattle firm Patano Studio Architecture. The home is insulated with cellulose, a material made from 85 percent post-consumer recycled content, which is densely packed into each stud cavity. “An overarching concept for the house was to let the materials age over the years, enhancing a sense of time and place for the project,” Patano says. Locally sourced larch, milled specifically for the project, features prominently throughout the home. On the exterior, vertical wood siding boards are fastened with stainless steel nails over a proprietary moisture barrier, allowing ventilation and preventing water intrusion. The waist-high larch barrier around the 700-square-foot deck provides privacy. On the first level, the living room and dining room connect to a southeast-facing terrace, which catches the morning and midday sun. A pair of larch sliding doors join the two rooms. Two Marcel Breuer Wassily chairs from Knoll flank the rug, from Room & Board, and Portland Willamette Ovation II fireplace. Porcelain tile by Urban Concrete is used throughout the home. Lighting fixtures by LBL Lighting illuminate wallpaper from wallpapered.com that depicts a map of the Puget Sound. The kitchen opens up to the dining room to facilitate social cooking and eating. “Since everyone gathers in the kitchen, we designed a long galley-style layout with extra width between counters,” Patano says. Casework and Calacatta quartz countertops by Pedini complement the ovens and cooktop, both by Miele, and a Blanco faucet and Elkay sink. A larch stairway leads to the bedrooms and bathrooms. 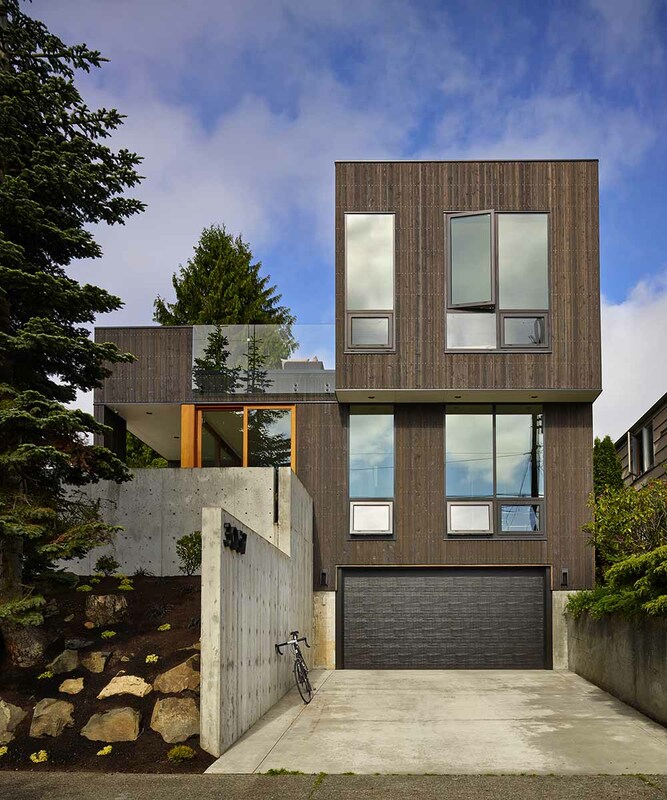 “We chose larch for its natural decay resistance, durability, and beauty,” Patano says. In the master bathroom, a Duravit tub and pair of sinks are surrounded by black and white Crossville tile. The master bedroom offers sweeping views of the Seattle skyline looking east over Elliott Bay. Seattle-based architect Christopher Patano and his wife had a vision for their 1950s ranch-style residence: to transform it into a home that used as little energy as possible. They decided to build upon its existing foundation and let the conditions of the south-facing lot—a valued commodity in the gray Pacific Northwest—guide their design. Named BLK_LAB for the family dog, Macy (a black lab), the home reflects the couple’s love of modernism and nature by combining functional forms with locally-sourced materials to create light-drenched living spaces. A south-facing band of large fiberglass windows along the three-story stairwell and upper deck pulls sunlight into the home. Strategically located operable windows allow for natural ventilation during warmer months, with breezes rolling off nearby Elliott Bay. Features like LED lighting, an induction cooktop, and radiant floors help minimize BLK_LAB’s carbon footprint; a solar array is being installed this month to further reduce the need for off-site energy.